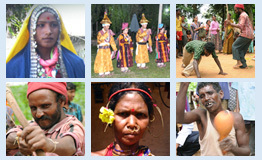 ‘Hakkipikki’ is one of the major tribal communities in Karnataka. In Kannada the word ‘Hakki’ stands for ‘bird and ‘Pikki’ stands for verb ‘to catch’, therefore, the community is known as the ‘bird catcher’ which is their traditional occupation. However, some scholars consider the word ‘Hakkipikki’ used as the echo form. The Hakkipikki community migrated from the Northern India population which is about 8414 (2001 census) is found in Karnataka. The population is mainly concentrated in Shivamogga, Davanagere and Mysuru district of Karnataka. The alternate names of the Hakkipikki are Haranashikari, Pashi pardhi, Adavichencher and Shikari in Karnataka as per the available materials. Though the community lives in Southern part of India surrounded by Dravidian languages, they speak Indo Aryan language. Scholars named their mother tongue as ‘Vaagri’. They speak ‘Vaagri’ at home but they speak Kannada for their daily business. The UNESCO has listed Hakkipikki is one of the endangered languages. The documentation of the language spoken by Hakkipikki community has been undertaken by the SPPEL and a pilot survey has been carried out. For the pilot survey, a fieldwork has been conducted in Hakkipikki community and approximately 1500 words and 150 sentences have been recorded with audio recorder. The slicing of sound file and transcription work of around 1000 words has already been done. Presently, the analysis of the recorded data for writing grammar and entering data along with sound and pictures into Lexique Pro software for making trilingual electronic dictionary are in progress.